WATERLOO, WI -- (MARKET WIRE) -- July 1, 2005 -- Trek made its name as a pioneer in the world of carbon fiber over 15 years ago by pioneering the use of carbon fiber for bicycle frame production. In 1992, Trek introduced its proprietary OCLV (Optimum Compaction Low Void) Carbon tubing which is used exclusively in the manufacturing of bikes at our Waterloo, Wisconsin, factory. Since then, we have gained an invaluable expertise in the design and fabrication of carbon fiber frames highlighted with an array of racing victories, most notably, six consecutive Tour de France victories. No other bicycle company in the world can match this level of experience in the production of carbon fiber bicycles. Equally so, no other bicycle maker has enjoyed as much success in every realm of cycling competition as Trek and their American-made OCLV Carbon frames. 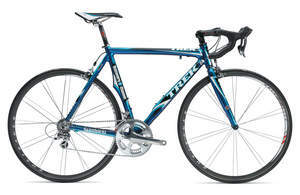 While there is no shortage of carbon fiber bicycles in the market today, no other bike brand can lay claim to the carbon technology exhibited by the variety of Trek OCLV Carbon platforms. Trek engineers have created a family of performance-specific OCLV Carbon products that have been used to not only win the Tour de France six times, the Vuelta Espana and the Giro d' Italia, but also everything from Olympic medals to mountain bike and IronMan world championships. The numeric designations associated with OCLV relates to the GSM (grams per square meter) measurement of the material. Thus, OCLV 120 is heavier that OCLV 110 because it has more grams of material per square meter. The biggest benefit of using carbon fiber for a bicycle frame is its ultimate strength to weight ratio. Trek has invested millions of dollars and 15 years in perfecting our patented OCLV process. If there are any air bubbles in the laminate, these create voids (air pockets within the structure) or weak spots. We have yet to test a competitor's frame that doesn't have issues with either voids or wall thickness control. The approved aircraft industry spec for carbon laminate is under 2% voids. Trek OCLV frames average fewer than 1% voids. To overcome the problem of excess voids competitors must add extra material, or filler, for reinforcement. Also, with some one-piece construction techniques there are issues of controlling wall thickness throughout the structure. Trek Carbon frames are constructed from individual tubes and lugs utilizing our OCLV process and then joined together by a high-tech adhesive. Each frame is meticulously handcrafted from start to finish. Our unique design method allows us to maximize the strength and stiffness of each part while minimizing material usage and ultimately controlling weight. The quality and consistency of each frame part is strictly controlled and measured to our optimum compaction, low void standard. In the recent rush to carbon production by many bike companies, there have been quite a few claims made between different brands about their bikes being the lightest on the market. The simple truth is that anyone can build a light bike. Ultimately, what separates a bike that claims to be the lightest from a bike that wins the Tour de France six times is its stiffness to weight ratio and the ride quality that results. Trek's performance road frame geometry is based on years of testing and evaluating with the best riders in the world, including current six-time TdF champion, Lance Armstrong. Each OCLV frame offers the ultimate balance of stiffness, comfort and handling. This is especially important when talking about the bikes sold to the public. Lance Armstrong has won every Tour de France on a production bicycle. That means that the same Tour-proven geometry Lance has relied on to make history is the same geometry used to build bikes for performance-minded cyclists around the world. The most important point to remember about carbon fiber bikes is that not all carbon bikes are built the same. Different manufacturers use a wide variety of shapes, diameters, and wall thicknesses which change the stiffness, weight, and strength of the frame. Ever since we developed our OCLV Carbon process in 1992, we've been refining every aspect of its design and manufacturing. There is no outsourcing or shared technology. With our hands-on building process, every OCLV rider can have a bike just like the one that carried Lance to the finish line on the Champs d'Elysee. --  Trek does not build custom frames - we race what we sell. --  Trek offers a lifetime warranty on every OCLV frame we make. frame material, producing a ride worthy of a champion. Trek's proprietary OCLV Carbon was developed in 1992 and<br> has won the Tour de France six times.